Uechi-Ryū (上地流, Uechi-Ryū) is a traditional style of Okinawan karate. Uechi-Ryū means "Style of Uechi" or "School of Uechi". Originally called Pangai-noon, which translates to English as "half-hard, half-soft", the style was renamed Uechi-Ryū after the founder of the style, Kanbun Uechi, an Okinawan who went to Fuzhou in Fujian Province, China to study martial arts and Chinese medicine when he was 19 years old. After his death, in 1948, the style was refined, expanded, and popularized by Kanbun Uechi's son, Kanei Uechi. Kanbun Uechi studied a style of Southern Chinese kung fu Pangai-noon (traditional Chinese characters: 半硬軟) meaning "half-hard, half-soft" in the Fujian province of China, in the late 19th century and early 20th century under a teacher and Chinese medicine hawker known in Japanese as Shū Shiwa (Chinese: Zhou Zihe 周子和 1874-1926). Shū Shiwa/Zhou Zihe's life is not well documented. Some have suspected without conclusive evidence that he had connection with the secret societies which worked for the overthrow of the Qing dynasty and the restoration of Ming dynasty. Research by the Fuzhou Wushu Association reported in 1984 revealed that he was born in the Zhitian Village (直田村) in 1874 to family wealthy enough to have him educated in letters and fighting arts which included weapons and Tiger Fist Kung Fu. The exact provenance of the romanization "Pangai-noon" is not clear, and it may be from the lesser-known Min Chinese language. It is not a Japanese, Okinawan nor Mandarin Chinese pronunciation of the original characters. The standard Japanese pronunciation of the three characters is han kō nan (はんこうなん), while the standard Mandarin pronunciation is bàn yìng ruǎn. The Cantonese language pronunciation is bun ngaang yun. In modern times, the katakana version of pangainoon (パンガイヌーン) has been used in Japanese writing rather than the kanji (半硬軟). While the Fuzhou Wushu Association confirmed the meaning of "half-hard, half-soft" in interviews in 2012, in 1934, Kanbun Uechi explained to Kenwa Mabuni when he asked about the meaning of "Pangai-noon" that it referred to the rapid speed of the kata. After studying about 10 years under Shū Shiwa/Zhou Zihe, Kanbun Uechi opened his own school in Nanjing in 1906, and he continued periodic training under Zhou Zihe for a total of 13 years. Three years later, Kanbun Uechi returned to Okinawa, determined never to teach again because reportedly one of his Chinese students had killed a neighbor with an open-hand technique in a dispute over land irrigation. While in Okinawa, Kanbun Uechi did not teach his martial art. In 1912, a tea merchant and White Crane Kung Fu master Go Kenki (Wú Xiánguì) who knew him settled in Okinawa. As word spread from Go Kenki that Kanbun Uechi was a skilled martial arts teacher, he received requests to teach but refused. Due to the economic situation in Okinawa, in 1924, at the age of 47, Kanbun Uechi left for Wakayama City, Wakayama Prefecture, Japan to find employment. While he was working as a security guard for a local cotton spinning mill,  he was persuaded by a co-worker, Ryuyu Tomoyose, to teach him privately. After two years of private lessons, Ryuyu Tomoyose and about 30 other men interested in learning convinced Kanbun Uechi agreed to resume teaching. He taught in small rooms in the company dormitory before work, during lunchtime, and after work until 1932 when he opened a general store and the "Pangai-noon Karate Academy" to the general public. In 1940, he and his students, including his son Kanei, renamed the system "Uechi-Ryū Karate-Jutsu" (上地流空手術) in his honor. 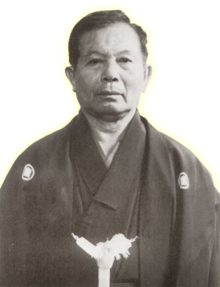 Kanbun Uechi's son, Kanei Uechi, taught the style at the Futenma City Dojo, Okinawa, and was considered the first Okinawan to sanction teaching foreigners. One of Kanei's students, Ryuko Tomoyose, son of Ryuyu Tomoyose, taught a young American serviceman named George Mattson who authored several books on the subject and is largely responsible for popularizing the style in America. Uechi-Ryū emphasizes toughness of body with quick blows and kicks. Some of the more distinctive weapons of Uechi practitioners are the one-knuckle punch shōken zuki (小拳突き, shōken zuki), spearhand nukite (貫手突き, nukite), and the front kick shōmen geri (正面蹴り, shōmen geri) delivered with the first toe (sokusen geri). On account of this emphasis on simplicity, stability, and a combination of linear and circular movements, proponents claim the style is more practical for self-defense than most other martial arts. In contrast to the more linear styles of karate based on Okinawan Shuri te or Tomari-te, Uechi-Ryū's connection with Chinese Nanpa Shorin-ken means the former shares a similar foundation with Naha-te (and thus with Gōjū-Ryū) despite their separate development. Thus, Uechi-Ryū is also heavily influenced by the circular motions which belong to the kung fu from Fujian province. Uechi-Ryū is principally based on the movements of three animals: the Tiger, the Dragon, and the Crane. Sanchin kata is deceptively simple in appearance. It teaches the foundation of the style, including stances and breathing. Kanbun Uechi is quoted as saying, "All is in Sanchin." Sanchin (三戦): Literally translated as "three fights/conflicts". From the kanji 三 ("three") and 戦う ("to fight/to struggle"). Usually interpreted as three Modes/Conflicts: "Mind, Body and Spirit." Kanshiwa (完子和): A combination of the first kanji in Kanbun's name, and the last two kanji written in Chinese order of Shu Shiwa's name in Japanese pronunciation. Originally known as "Kanshabu" based on earlier mistranslation of Zhou Zihe's name into Japanese as "Shu Shabu." Kanshū (完周): A combination of the first kanji in Kanbun's name, and the kanji for Shu Shiwa's family name (Shu) [see previous note on pronunciation]. Originally known as Daini Seisan (第二十三) or "Second Seisan," it was created by Seiki Itokazu in the 1950s. Seichin (十戦): Literally translated: "10 fights/conflicts," or a combination of the names of Seisan and Sanchin. Created by Saburo Uehara in the 1950s. Seiryū (十六): Literally translated: "16." Created by Kanei Uechi in the 1950s. Kanchin (完戦): A combination of Kanbun's first kanji 完 and "fight" 戦. Created by Kanei Uechi in the 1950s. Sanseiryū (三十六): The kanji was originally pronounced "Sandairyū," literally translated: "36." Sometimes interpreted as "thirty-six modes of attack and defense" or "36 positions to attack/defend from." While apocryphal, the 1977 Uechi-Ryū Kihon (Techniques Book) claims Shu Shiwa was also known as "The 36th Room Priest" to suggest the interpretation of the name as the "36th Room Kata" made from techniques taught individually in the previous 35 rooms. Originally, Okinawan styles use the gold bars on black belts to denote the various masters titles rather than ranks after fifth dan. Thus one gold stripe designated Renshi (錬士), two designated Kyōshi (教士), and three designated Hanshi (範士). In the early 2000s, different Okinawan styles started using the stripes to designate dan grades above godan. Others, including many Uechi organizations, have followed suit, while others have not. Kanei Uechi, besides adding kata, also introduced a sequence of exercises to the Uechi-Ryū training regimen. The junbi undō (準備運動, junbi undō) are warm-up and stretching exercises based on Asian school training exercises. The hojo undō (補助運動, hojo undō) are standardized exercises that incorporate elements of all of the katas of the system as well as additional techniques. Kanei Uechi developed a set of pre-arranged sparring exercises for the pre-black colored belt ranks. These exercises are referred to as yakusoku kumite (約束組み手). They involve two partners exchanging a formal sequence of blocks and strikes. There are five to eleven of these exercises, and each one involves three to six exchanges of single blocks and strikes. The kumite exercises involve blocks and strikes that are, for the most part, also found in Uechi-Ryū kata. Thus, like kata no bunkai, these exercises help students become familiar with the application of Uechi-Ryū techniques. Typically, the highest kyu ranks are expected to be able to move through these exercises with great strength and fluidity. Dan level students practice additional pre-arranged sparring exercises. Applications of kata are also practiced in a pre-arranged format. These patterns are called kata no bunkai (型の分解). Kanshiwa Bunkai and Seisan Bunkai date to the time of Kanei Uechi. Individual dōjō may create other bunkai for the other katas, such as Kanshu and Seichin, and these will vary in format more from dōjō to dōjō. "Okikukai"—沖空会--"Okinawan Karate-Dō Association"—沖縄空手道協会—from the late 1990s to early 2000s developed a "San Sei Rui Bunkai". Videos made during this time as well as a book, and later DVD  document how the sequence developed over time. Interestingly, a recent project headed by the Okinawan government involving many Uechi groups in Okinawa to publish a manual with a DVD for the style has non-"Okikukai" members demonstrate a form of the bunkai that has some slight variations from the current "Okikukai" version. Special forms of strength training and body conditioning are generally practiced in Uechi-Ryū drilling. A formal Uechi-Ryū forearm conditioning exercise, called kote kitae (小手鍛え), or "forearm tempering," involves variations of striking a partner's forearms with ones fists and forearms. Kanbun Uechi learned this conditioning exercise in China. Similar exercises involve conditioning the legs ashi kitae (足鍛え), or "leg tempering." Uechi-Ryū also trains with makiwara, as well as incorporates other traditional Okinawan physical conditioning exercises as part of their training, such as plunging hands into baskets full of rocks, or performing Sanchin kata stepping while gripping nigiri gamae (握りえ構え) (heavy ceramic jars). Like many arts, Uechi-Ryū experienced organizational splits after its founder's death. Nevertheless, in 2018 as part of its Okinawan Karate Style Research Project, the Okinawan Government brought together seniors from some of the main organizations which include the Okinawan Karate-Dō Association (沖縄手道協会), Kenyukai (拳優会), Konan Ryu Shureikai (硬軟流守礼会), and the Uechi-Ryū Karate-Dō Association (上地流空手道協会). Pangai-noon In 1978 a group of Uechi-Ryū students headed by Seiko Itokazu and Takashi Kinjo broke away from the Ryū due to political disagreements occurring there and the desire to teach kobudo in their dōjō, and they adopted the style name Pangainoon Ryū. By the early 1990s Itokazu and Kinjo had renamed this breakaway style to Konan Ryū. In the 2000s Kinjo and his students began using the style name Kobu Ryū, however one of Kinjo's students, Mikio Nishiuchi, has reverted to using the style name Pang Gai Noon Ryū. This name has also been used by later groups over the years who have practiced the additional kata and exercises. All extant organizations are either former Uechi-Ryū organizations or schools that chose to use the old name, or current Uechi-Ryū schools which wish to give homage to the old name. 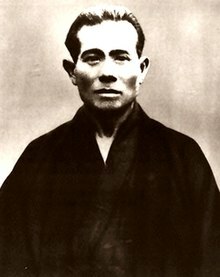 Shōhei-Ryu After the death of the founder's son, Kanei Uechi, most of the senior practitioners of the original art split for political and personal reasons from his son Kanmei Uechi to form the Okinawa Karate-Dō Association (沖縄手道協会). Barred by Kanmei Uechi from using his family name, the Okinawan Karate Dō Association eventually decided to rename its system Shōhei-ryu (昭平流) which combined the Late Emperor Hirohito's reign name Shōwa and his son Emperor Akihito's Heisei to mean "to shine brightly with fairness, equality, and peace." The Okinawan Karate Dō Association added a new two-man prearranged exercise yakusoku kumite (約束組み手) and an application or bunkai (分解) form for the third original kata: "Sanseiryū bunkai." One teacher developed an additional kata which was deemed by the Okinawan Karate Dō Association to be a kata for his school. With the name "Uechi-Ryū" passing out of copyright in Okinawa, an easing of political and personal disagreements, and a desire to promote the style in anticipation of the 2020 Summer Olympics, on September 18, 2016, the Okinawa Karate-Dō Association officially dropped "Shōhei-Ryū" and returned to the name "Uechi-Ryū." ^ "Founder of Uechi-ryu: Kanbun Uechi". Okinawa Prefectural Government. Archived from the original on February 19, 2005. ^ Uechi, Kanei: Seisetsu Okinawa Karate-do: Sono Rekishi to Giho [Skill and Theory of Okinawa Karate. Its History and Techniques]. Uechi-Ryu Karate-Do Kyokai, Ginowan, Okinawa, Japan 1977. ^ Hokama, Tetsuhiro (2005). 100 Masters of Okinawan Karate. Okinawa: Ozata Print. p. 27. ^ Fujimoto, Keisuke (2017). The Untold Story of Kanbun Uechi. p. 28. ^ Fujimoto, Keisuke (2017). The Untold Story of Kanbun Uechi. p. 31. ^ Fujimoto, Keisuke (2017). The Untold Story of Kanbun Uechi. p. 19. ^ "Pan Gai Noon Ryu Karate-Do Seibu-Juku". ^ Fujimoto, Keisuke (2017). The Untold Story of Kanbun Uechi. pp. 30, 80. ^ Mattson, George; The Way of Karate. The Way of Karate, Tuttle Publishing, 1963, p. 24. ^ Uechi, Kanei; Seisetsu Okinawa Karate-Dō: Sono Rekishi to Gihō. Seisetsu Okinawa Karate-Dō: Sono Rekishi to Gihō, Uechi-Ryū Karate-Dō Kyōkai, Ginowan 1977, p. 33. ^ Fujimoto, Keisuke (2017). The Untold Story of Kanbun Uechi. p. 43. ^ a b c d e f g h i 上地流: Uechi-Ryu Manual. 2018. ^ "Go Kenki: The Undercover Kung-fu Pioneer of Okinawan Karate". www.karatebyjesse.com. 2012-02-12. Retrieved 2018-01-17. ^ "Go Kenki (Wú Xiánguì)". shitokai.com. Retrieved 2018-01-17. ^ Fujimoto, Keisuke (2017). The Untold Story of Kanbun Uechi. p. 54. ^ Fujimoto, Keisuke (2017). The Untold Story of Kanbun Uechi. p. 59. ^ Fujimoto, Keisuke (2017). The Untold Story of Kanbun Uechi. p. 64. ^ Fujimoto, Keisuke (2017). The Untold Story of Kanbun Uechi. p. 71. ^ Fujimoto, Keisuke (2017). The Untold Story of Kanbun Uechi. p. 72-75. ^ Fujimoto, Keisuke (2017). The Untold Story of Kanbun Uechi. p. 80. ^ a b Okinawa Traditional Martial Arts for the 21th ("sic") Century. 2006. ^ Mattson, George. "Rank, Stripes and Titles". Uechi-ryu Martial Arts. Retrieved 2016-02-01. ^ "Uechi-Ryu Kokusai of Alexandria, Virginia". Uechi-kokusai.com. Retrieved 2016-02-01. ^ "Uechi Ryu Karate Do Kokusai Kyokai - Kokusai Association". Okinawan Karate Academy. 1991-02-02. Retrieved 2016-02-01. ^ a b Takamiyagi, Shigeru (1996). An Introduction to the Okinawan Traditional Karate: Aspect of Karate as Martial Arts. pp. 241–281. ISBN 4-87215-083-X. ^ Bishop, Mark (1999). Okinawan Karate. pp. 38–41. ISBN 978-0-8048-3205-2. ^ "Pang Gai Noon Ryu Karate-Do Seibu-Juku". ^ "Okinawan Karate Club". Stoughtondojo.com. Retrieved 2015-09-26. ^ "Ji Teki Jyukui". Ji Teki Jyuku Association. Retrieved 2016-02-03. ^ "Frame Page". Alandollar.com. Retrieved 2016-02-01. ^ "沖縄空手道協会 公式ホームページ". Okikukaihq.jp. Retrieved 2018-09-26. ^ "OkinawaKaratedoKyokai". Okikukai.jp. Retrieved 2016-02-01. ^ Mattson, George. "Uechi-ryu Martial Arts | Karate". Uechi-ryu.com. Retrieved 2016-02-01. ^ "上地流空手道振興会". ja-jp.facebook.com/uechiryushinkoukai.shinjuku.fuchu. Retrieved 2016-02-04. ^ "Uechi-Ryū Kokusai Kyokai: Welcome To Uechi-Ryu Karate International Association". Uechi-kokusai.com. Retrieved 2016-10-21. ^ "Okinawan Karate Academy: Uechi-Ryu Karate Do Kokusai Association". okinawankarateacademy.us. Retrieved 2016-10-21. ^ "Welcome to the world of Traditional Uechi-Ryu, the official web of Uechi-Ryu Karate-Do Shubukai International". Retrieved 2018-10-12. ^ "IUKF". IUKF. 2014-06-20. Retrieved 2016-02-01. ^ "Darin Yee – New IUKF President » IUKF". iukf.net. Retrieved 2018-11-26. ^ "North American Jiteki-Jyuku Karate Association". uechikarate.org. Retrieved 2019-01-21. ^ "Início". Okikukai.com.br. Retrieved 2016-02-01. ^ "Karate Uechi-Ryu". Okikukai Karate Italia. Archived from the original on 2016-01-11. Retrieved 2016-02-01. ^ "Ryukokaku Karate and Kobu Dō Association". Retrieved 2016-09-25. ^ "Bob Bethoney's Uechi-Ryu Karate Academy". bobbethoneyuechikarate.com. Retrieved 2016-08-31. ^ "Butokukai". Buzz Durkin. Retrieved 2016-02-03. ^ "Uechi International | Uechi International Karate Association". uechi-international.com. Retrieved 2019-01-24. ^ "Uechi-Ryū Karate Dō Europe". www.uechiryu-europe.or. Retrieved 2018-07-08. ^ "World Uechi-Ryū Karate Dō Kobudō Organization". www.WUKKO.org. Retrieved 2018-09-22. Alan Dollar, Secrets of Uechi Ryu and the Mysteries of Okinawa, Cherokee Publishing: 1996. Donald B. Joyner, Uechi Ryu Karate-Do Student Guide and Handbook: A Study Guide for Uechi Ryu Karate-Do, 1996. Donald B. Joyner, George Miller Joyner, The Art and History of Uechi Ryu Karate-Do: A Study Guide for Uechi Ryu Karate-Do, Joyner's Professional Karate: 1996. Keisuke Fujimoto, The Untold Story of Kanbun Uechi: Founder of the legendary martial art, Uechi-ryu Karate Pangai-noon Kenpo Academy, Robort Garone, translator, Okinawa Uechi-ryu Karate-Do Association Tokyo Branch: 2017. George E. Mattson, The Way of Karate, Charles E. Tuttle Company: 1963. George E. Mattson, Uechiryu Karate Do (Classical Chinese Okinawan Self-Defense), Peabody Publishing Company: 1997 (8th printing). Ihor Rymaruk, Karate: A Master's Secrets of Uechi-ryu, Iron Arm International: 2004. Okinawa Karate Style Research Project, 上地流 Uechi-Ryu Manual, Okinawa Karate Promotion Division, Department of Culture, Tourism, and Sports, Okinawa Prefectural Government: 2018. Shigeru Takamiyagi, Toshio Higa, Katsuyoshi Higa, An Introduction to the Okinawan Traditional Karate: Aspect of Karate as Martial Arts [沖縄空手道概説―武道空手の諸相], Okinawan Karatedō Association: 1996. This page was last edited on 17 April 2019, at 13:44 (UTC).